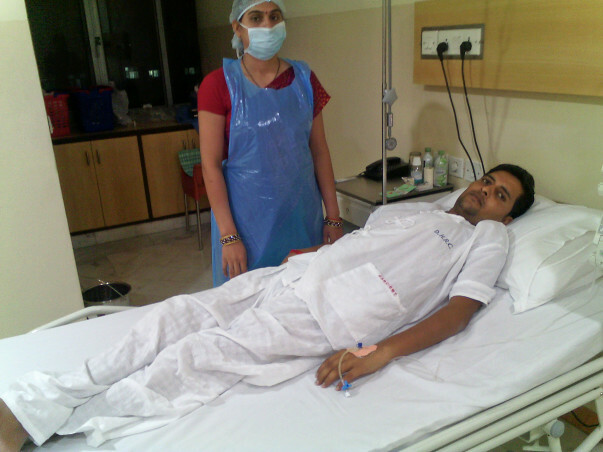 Mr. Manoj Mishra, a youth of age just 30 years, is suffering from blood cancer. He is undergoing treatment at Dharamshila Hospital, New Delhi. He is the only person to look after his family of two kids and his wife. Doctors have suggested that his life could be saved only with Bone Marrow Transplantion. But the estimate is Rs 35 lakhs. The patient is a small farmer of Basti district of Eastern Uttar Pradesh. His parents have spent what ever they had and is now struggling to make ends meet. Your contribution could save their lives. The funds will used for Bone Marrow Transplantation. Please find the estimation letter from the doctor. NDTV coverage on his condition could be seen on the below link. This is Ram Pandey, relative of Manoj Mishra. It is very difficult for me to share this news. Manoj passed away in the evening of 25th December 2015. Doctors told that he passed away due to a heart attack. His whole village is grief-struck. All these months of struggle and now Manoj is not with us. When I posted an update to you all on Friday afternoon, we had very little hope, but all of us were in prayers. It was your support that kept Manoj with us for this long. His family is grateful for that. Your contribution so far has been utilized for his treatment. Please keep the family in your prayers. They have to start their life from scratch. Once again thank you very much! 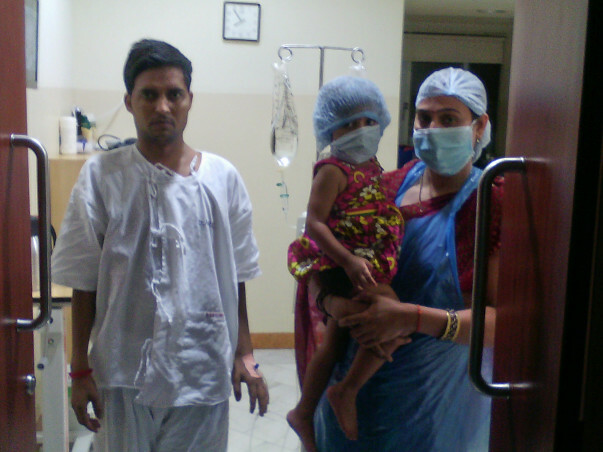 Your help towards Manoj and his family will come back as blessings to you and your family. I am very sorry to update to all great supporters that two days back Manoj was unconscious in the morning. Manoj is on ventilator. Doctors are saying that very little hope is remaining for Manoj. After all the diagnosis they are not able to state the reason behind this mishappening. Kindly pray for him. What is troubling the family is the money they need to clear the dues of around two lakhs in the Hospital. Pleae keep him in pprayers. Mr. Manoj was doing well after transplant and doctors at Dharamshila told us that Manoj is completely cured by blood cancer. But he has faced acute infection. 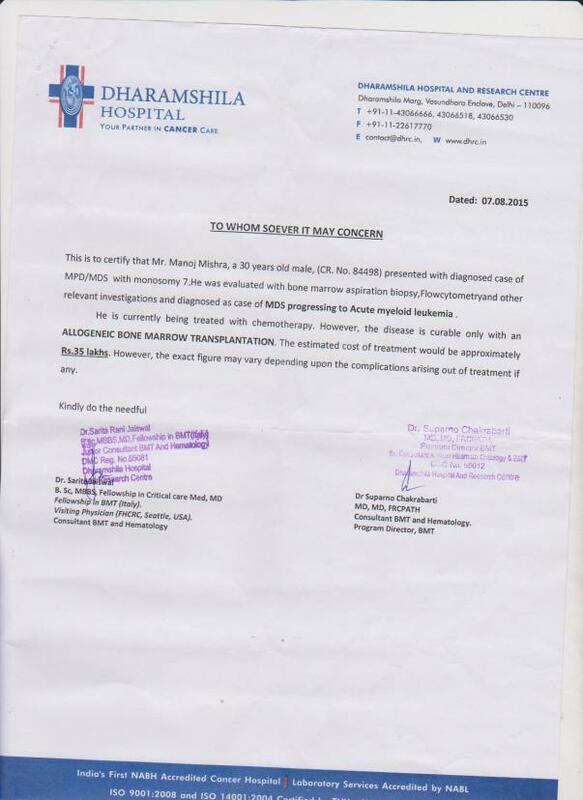 Now Doctors at Dharamshila has referred him to Medanta Medicity, Gurgaon for lever related issues. Doctor at Medanta said that he is suffering with ulcer in both intestines. Please keep him in your prayers. Hoping the estimation will not increase. Thank you for your support. My best wishes for you my friend. Get well soon.